Callcentric is a competitive VoIP service that not only lets you make and receive phone calls to traditional phones worldwide at fantastic rates, but also allows you to talk to other Callcentric members for free. If you have family and friends scattered across the globe, then this provider can be the one to bring you all together. With no signup fee and no charges between Callcentric members, you can talk to them anywhere, anytime, absolutely free. You can also use Callcentric with the convenient Callcentric iPhone and Android apps. The company also offers a range of faxing services. Callcentric operates via your broadband internet connection and various downloadable software applications on your computer or telephone adapter to send and receive calls. By calling another Callcentric member’s 1777 number, which is allocated for free after signup, you can send or receive unlimited free calls. With the company’s flexible rate plans you can also make calls globally to all regular or mobile phones. In addition, in over 35 different countries you have the option to order a phone number to accept calls as well. Even better, if your circumstances change you have the freedom to update your plan(s) at any time. Callcentric is fully supported by a range of devices, such as the 3CX Grandstream HandyTone 702, Cisco SPA112, Gigaset C610A IP and Asterisk. The company also boasts several premium features. For example, for $25 per number you can get Local Number Portability. Callcentric prides itself on its ease of use and flexibility. All that is needed to set up your VoIP service is a reliable broadband internet connection and a softphone. Callcentric generously offers customers their very own free softphone. To switch existing infrastructure to the new virtual phone system, Callcentric provides setup guides for the most common UA (hardware or software) used with them on the ‘setup’ area of their website. 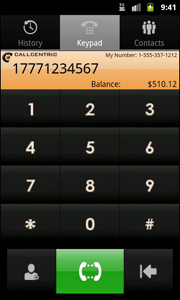 Even better; you don’t need a credit card with Callcentric in order to make calls to other Callcentric members. Lastly, you are free to choose which incoming and outgoing service plans best fit your calling patterns. 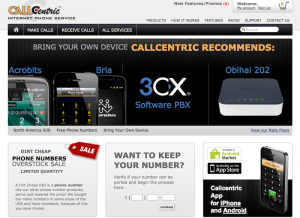 Callcentric offers multiple service plans to suits all types of users. To make calls, you have the option of six different plans. With no setup or monthly fee, the IP Freedom plan gives you unlimited in-network calls to Callcentric customers and other VoIP networks and the Pay Per Call plan lets you make low-rate calls worldwide. The other plans start from $6.95 per month: North America 500 and 1000 give you calls to USA, Canada and Puerto Rico, as well as low-rate calls worldwide. North America Residential is a little more expensive and lets residential customers make unlimited calls to USA, Canada and Puerto Rico. Lastly, World Select Residential gives residential customers unlimited calls to over 35 countries. To receive calls you have the option of seven unique plans. These range from the Free Phone Number plan, which gives you unlimited incoming minutes to various parts of NY state with no setup or monthly fee, to the Service Provider Unlimited plan, which gives you unlimited incoming minutes to the US and Canada for as little at $19.95 per month. Finally, the International Unlimited plan lets you have unlimited incoming minutes to over 40 countries. Callcentric offers a comprehensive level of customer service, and support is free for all members. In the ‘support’ area on the website you will find an impressive knowledge base that is regularly updated by Callcentric. They provide support for your FAQs and if your question is not answered then you can open a trouble ticket by clicking on the ‘Contact Us’ link above. In addition, Callcentric offers their unique BYOD (Bring Your Own Device) setup guides for many supported devices and software to get you up and running in no time.